SOURCE: Adapted from http://www.epa.gov/ttn/chief/trends/trends99/tier3_1999emis.pdf . Criteria pollutants, regulated to achieve the attainment of the National Ambient Air Quality Standards (NAAQS), including primary standards for the protection of public health, ". . . the attainment and maintenance of which, . . . allowing an adequate margin of safety, are requisite to protect public health," and secondary standards for the protection of public welfare. 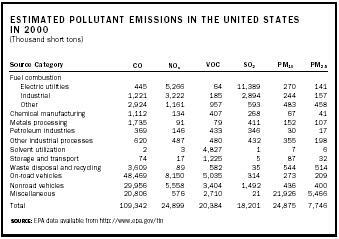 The first six criteria pollutants were carbon monoxide (CO), nitrogen dioxide (NO 2 ), sulfur dioxide (SO 2 ), total suspended particulate matter (TSP), hydrocarbons, and photochemical oxidants. Lead was added to the list in 1976. In 1979 the photochemical oxidants standard was replaced by one for ozone (O 3 ), and in 1983 the hydrocarbons standard was dropped altogether. 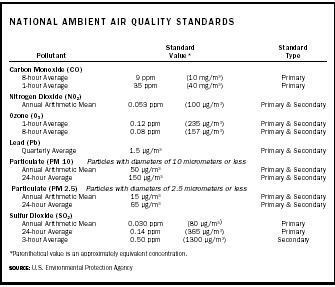 In 1987 TSP was changed to PM 10 , and in 1997 PM 2.5 was added to the official list and the ozone standard revised. National Emission Standards for Hazardous Air Pollutants (NESHAP) were established. 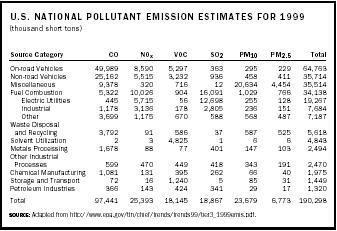 A hazardous air pollutant (HAP) was defined as one "to which no ambient air standard is applicable and that . . . causes, or contributes to, air pollution which may reasonably be anticipated to result in an increase in mortality or an increase in serious irreversible or incapacitating reversible illness." Examples include asbestos, mercury, benzene, arsenic, and radionuclides. The original NAAQS for PM was set in 1970. In 1987, the total suspended particulate matter, TSP, was revised, and a PM 10 (particulate matter with an aerodynamic diameter of 10 μm or less) standard was set. PM 10 , sometimes known as respirable particles, was felt to provide a better correlation of particle concentration with human health. In 1997 the particulate matter standard was updated, to include the PM2.5 standard. These particles, known as "fine" particles, a significant fraction of which is secondary in nature, are especially detrimental to human health because they can penetrate deep into the lungs. Scientific studies show a link between PM 2.5 (alone, or combined with other pollutants in the air) and a series of significant health effects, even death. Sulfur Dioxide. Sulfur dioxide (SO 2 ) is colorless, nonflammable, nonexplosive gas. Almost 90 percent of anthropogenic SO 2 emissions are the result of fossil fuel combustion (mostly coal) in power plants and other stationary sources. A natural source of sulfur oxides is volcanic activities. In general, exposure to SO 2 irritates the human upper respiratory tract. The most serious air pollution episodes occurred when there was a synergistic effect of SO 2 with PM and water vapor (fog). Because of this, it has proven difficult to isolate the effects of SO 2 alone. SO 2 is one of the precursors of acid rain (the term used to describe the deposition of acidic substances from the atmosphere). Also, SO 2 is the precursor of secondary fine sulfate particles, which in turn affect human health and reduce visibility. Prolonged exposure to SO 2 and sulfate PM causes serious damage to materials such as marble, limestone, and mortar. The carbonates (e.g., limestone, CaCO 3 ) in these materials are replaced by sulfates (e.g., gypsum, CaSO 4 ) that are water-soluble and may be washed away easily by rain. This results in an eroded surface. Nitrogen Dioxide. Nitrogen dioxide (NO 2 ) is a reddish-brown gas. It is a lung irritant and is present in the highest concentrations among other oxides of nitrogen in ambient air. Nitric oxide (NO) and NO 2 are collectively known as NO x .
Anthropogenic emissions of NO x come from high-temperature combustion processes, such as those occurring in automobiles and power plants. Natural sources of NO 2 are lightning and various biological processes in soil. The oxides of nitrogen, much like sulfur dioxide, are precursors of acid rain and visibility-reducing fine nitrate particles. Ozone. Ozone (O 3 ) is a secondary pollutant and is formed in the atmosphere by the reaction of molecular oxygen, O 2 , and atomic oxygen, O, which comes from the photochemical decomposition of NO 2 . Volatile organic compounds or VOCs (e.g., what one smells when refuelling the car) must also be present if O 3 is to accumulate in the atmosphere. O 3 occurs naturally in the stratosphere and provides a protective layer from the sun's ultraviolet rays high above the earth. However, at ground level, O 3 is a lung and eye irritant and can cause asthma attacks, especially in young children or other susceptible individuals. O 3 , being a powerful oxidant, also attacks materials and has been found to cause reduced crop yields and stunt tree growth. In general, control of pollutants that are primary in nature, such as SO 2 , NO 2 , CO, and Pb, is easier than control of pollutants that are either entirely secondary (O 3 ) or have a significant secondary component (PM 2.5 ). Primary pollutants may be controlled at the source. For example, SO 2 is controlled by the use of scrubbers, which are industrial devices that remove SO 2 from the exhaust gases from power plants. SO 2 emissions are also reduced by the use of low-sulfur coal or other fuels, such as natural gas, that contain lower amounts of sulfur. NO 2 from industrial sources also may be minimized by scrubbing. NO 2 from cars, as well as CO, are controlled by the use of catalytic converters, engine design modifications, and the use of cleaner burning grades of gasoline. Lead emissions have been reduced significantly since the introduction of lead-free gasoline. 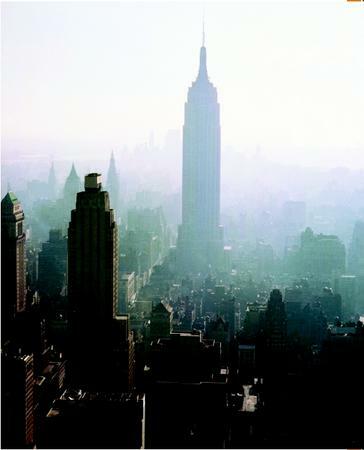 Ozone and particulate matter are two of the most difficult pollutants to control. Reduction of oxides of nitrogen emissions, together with a reduction of VOC emissions is the primary control strategy for minimizing ozone concentrations. Because a large portion of PM 2.5 is secondary in nature, its control is achieved by control of SO 2 , NO 2 , and VOC (which are the precursors of sulfates, nitrates, and carbon-containing particulates). SEE ALSO A CID R AIN ; C ARBON D IOXIDE ; C ARBON M ONOXIDE ; C LEAN A IR A CT ; C OAL ; E LECTRIC P OWER ; G LOBAL W ARMING ; G REENHOUSE G ASES ; L EAD ; O ZONE ; P ETROLEUM ; T OXIC R ELEASE I NVENTORY ; V EHICULAR P OLLUTION . U.S. EPA Web site. Available from http://www.epa.gov/air . ..thank you for posting this info in the internet. i hope everyone will have the chance to read and understand it. god bless.